Funny how I always assumed Fonzie wore a black leather jacket when it really was brown. I Guess because we didn't have HD back then.Also, for the years Happy Days was on prime TV,I was in the Cub Scouts/Boy Scouts and the meetings were Tues. at 8:00,so I always missed Happy Days.No VCR or On Demand TV back then,if you missed a show,you had to wait for Summer reruns. Hauntedheadful shouldn't feel bad. The jacket originally -was- black. 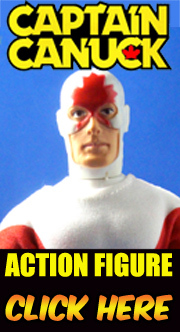 As the character became increasingly popular, the jacket changed to an extremely dark brown and then slowly lightened in following seasons. The studio was always walking a fine line with Fonzie and they knew it. When Happy Days first started it was implied the Fonz had a shady past. He was a greaser and a biker and a down-town tough guy. The Cunninghams (and by extension, the audience at home) learn not to trust appearances and to judge the character on who he his, not what he looks like. In this era of the Fonzie character, the jacket was solid black. Later, when Fonzie was -the- character on the show and they were already doing cross-overs with other shows, the jacket did start turning brown. Sometimes it got lighter brown even in the same episode of the same show. There are publicity photos where Fonzie is wearing a black jacket. My dad took me to see "The Wild One" at a local third-run movie theater one summer when I was little. 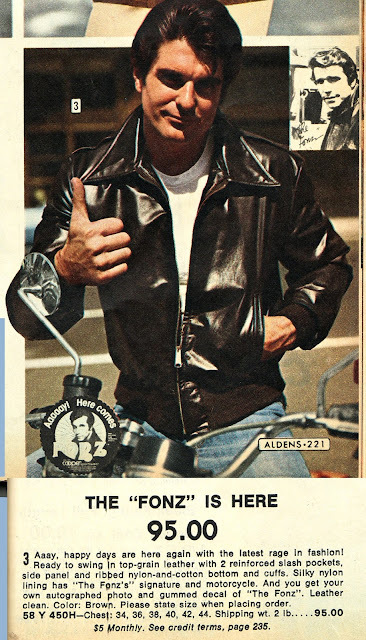 I hadn't seen Happy Days yet and when I did... *shakes head* Fonzie just wasn't "tuff" enough.